Click here to read a PDF of UCLA's Zero Waste Plan. UCLA will encourage Bruins to preserve the environment at its 5th annual Sustainability Fair on Wednesday, and it’s not just empty talk: The university’s waste-reduction strategy saved 20,500 tons of waste from the landfill this year. UCLA has reduced, reused and recycled its way to an 80-percent diversion rate – that is, diverting four-fifths of its total amount of trash from landfills, giving it one of the highest rates in the UC system. Last year, UCLA was one of four campuses above 70 percent. The next goal is to reach 100-percent diversion by 2020. To get to that magical number, the Recycling and Waste Taskforce of UCLA’s Sustainability Committee recently completed the campus’s Zero Waste Plan, said committee member and Chief Sustainability Officer Nurit Katz. The zero-waste goal focuses on “reduce, reuse, recycle” first, but for waste that can’t be repurposed, waste-to-energy services that convert trash into fuel will catch some of the final remnants of garbage leaving campus, Katz said. A materials recovery facility will also sort out any remaining recyclables that are being improperly tossed into trash cans. All Bruins need to participate to help minimize waste leaving campus, said Chris Gallego, recycling coordinator in Facilities Management. “If people make sure to be aware of the available containers and help out by putting things in the right place, whether outside or following the deskside programs, we should be able to get to zero waste,” Gallego said. UCLA also composts more than 60 tons of food waste per month at the dining halls, uses almost exclusively compostable food-to-go materials in its restaurants and repurposes all its green waste as mulch. Learn more about UCLA’s sustainability efforts, how to use the different recycling and trash bins, how to get discounts on public transit, and join in a few raffles at the Sustainability Fair today, from 11 a.m. to 2 p.m. in Bruin Plaza. 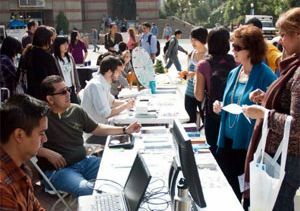 UCLA's 2011 Sustainability Fair. Image courtesy UCLA Transportation.